IN his continuing search for the more weird, wacky and wondrous in the world of travel, David Ellis muses over P&O Cruises' choice of ice-cream that it gave away to guests to celebrate Australia Day aboard it's liner Pacific Pearl that was in Sydney Harbour to take part in several of the harbour's big day events. 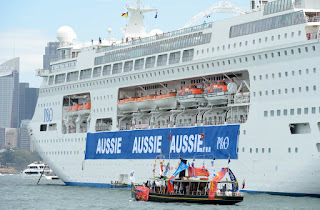 Because the company sponsored the Australia Day Sydney Harbour program, using Pacific Pearl's ship's whistle used to start the Tall Ships Parade, passengers helped judge the Best Dressed Vessel on the Harbour, and the ship boasted 100m long banners on either side with the iconic Aussie sporting catchcry "Aussie, Aussie, Aussie…." But while this was all very patriotic and passengers on board were also given those free ice creams to celebrate Australia Day, it turns out the choice of ice cream was less patriotic. Because it wasn't Aussie, Aussie, Aussie – but Enzie, Enzie, Enzie from the ship's onboard New Zealand ice cream parlour.